Jon Johnson File Photo/Gila Valley Central: The Thatcher Eagles will travel to Morenci on Friday for a matchup between two unbeaten Gila Valley teams. Safford and Thatcher were both on the road Friday night and both teams enjoyed the ride home after winning big over Coolidge and St. Johns, respectively. ST. JOHNS – It was a tale of two different teams in the first half as the St. Johns Redskins (5-1 overall, 2-1 section) had three turnovers and two punts on their five possessions while the Thatcher Eagles (6-1 overall, 3-0 section) could do no wrong and scored touchdowns on each of their five possessions. Thatcher’s Jake Dunlap intercepted St. Johns’ quarterback John Robertson’s first pass of the night and the Eagles never looked back, winning 50-8. The Eagles made a good case to finish at the top of the 2A East after dstroying two of the top three competitors in successive weeks. After converted tight-end now running back Nate Lee broke off a 17-yard rumble down to the 1 yard line, Dunlap took it in from there on the next play and opened up the scoring on the night. Dunlap finished a perfect 4-4 passing for 56 yards and two rushing touchdowns for the game. The Redskins converted a couple of short fourth downs on their next possession, but their drive again ended with an interception as Thatcher’s Aric Peterson plucked the ball out of the air and took it to Thatcher’s 40 yard line. After Shane Cook turned a 5-yard pass from Dunlap into a 28-yard gain, Lee answered the call and gained 34 yards on the drive to set the Eagles back up to score again. Dunlap then waltzed his way in from the 3 yard line for his second TD, and Thatcher was up 14-0 after the 2-point conversion. Tyler Roebuck then had a nice 25-yard punt return and Lee thanked him for the good field position by bursting untouched through the middle for a 39-yard TD. Lee would finish the night with 118 yards on 11 carries but did leave the game for a short while in the second quarter after getting hit in his calf on defense. Lee got his chance at running back as Thatcher looked to fill the void after Kaleb Mattice blew out his knee in the first game of the season. Lee started in earnest last week and hasn’t slowed down. Snowflake, which is unbeaten at 6-0 and number one in the 3A power rankings, squeaked out a 13-12 victory over Thatcher on a blown call that resulted in a 55-yard TD run. Thatcher is number one in the 2A power rankings. After another Redskins punt, Thatcher drove the ball down the field successfully and capped it off with a 4-yard TD run by Brandon Hayes to go up 28-0. Thatcher wasn’t finished however, and its defense answered the call again as Dallin Cook gathered Robertson’s third interception of the half and took it back 32 yards for a pick 6 with just 15 seconds left in the half. Thatcher went into the locker room smiling, up 35-0. The Eagles opened the second half just like the first and Trevin Clark capped of their drive with a 19-yard TD run. That put the Eagles up 42-0 and instituted the running clock mercy rule. With 2.25 left in the third, the Redskins finally forced an Eagles punt and managed to put together a sustained drive for the first time of the night. Scoreless through three quarters, St. Johns got on the board with a 2-yard TD run by Trent Sherwood with 9:42 left in the game. The 2-point conversion made it 42-8, Thatcher. After Thatcher backup quarterback Javan Montoya turned the ball over on a mishandled handoff fumble, Robertson returned the favor with a mishandled handoff fumble of his own. Thatcher’s Tyler Roebuck scooped up the loose ball and raced 60 yards to the end zone. 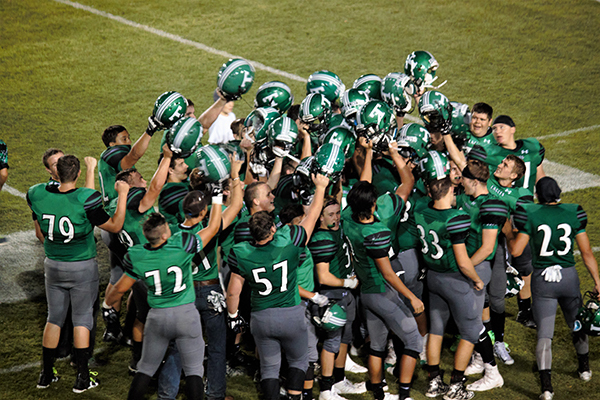 The 2-point conversion finished the scoring of the night, and Thatcher hit the road with a 50-8 victory. Thatcher has a bye next week and then will travel to Eager on Oct. 14 to take on Round Valley (5-0 overall, 1-0 section) for what could ultimately be the 2A East crown. Round Valley dispatched Miami (3-4 overall, 0-2 section) 62-18 on Friday night. COOLIDGE – The Safford Bulldogs broke their four game losing streak in a big way Friday, dominating the Coolidge Bears 49-14. Safford scored early and often on its way to a 42-14 halftime lead, and Alba described the game as his team’s best all-around effort. “Our kids came out aggressive from start to finish,” Alba said. Safford (3-4 overall, 1-1 section) is still in the playoff hunt and will host Queen Creek Benjamin Franklin (6-1 overall, 1-1 section) on Thursday. The Bulldogs will look to end the Chargers’ six game winning streak. Pima (5-1 overall, 1-1 section) had a bye and will travel to St. Johns next week. Fort Thomas (1-5 overall, 0-4 section) lost to Phoenix NFL Yet Academy, 36-6.